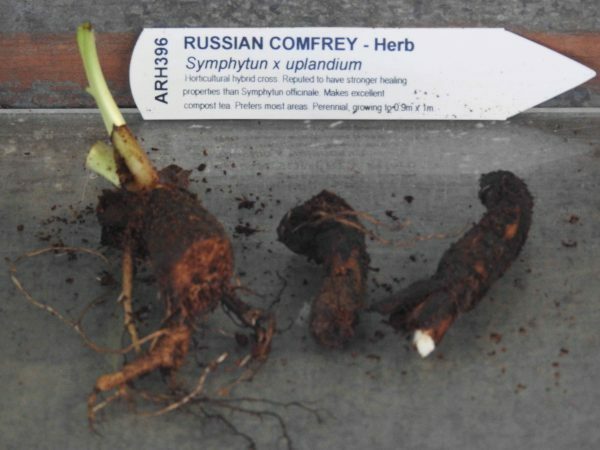 Russian Comfrey, Symphytun x uplandium, originated as a horticultural hybrid cross. It is reputed to have stronger medicinal properties than English Comfrey, Symphytun officinale. Comfrey is traditionally used in European folk medicine to help heal broken bones, wounds and sores. The large leaves are used in salads, steamed as a vegetable, and as fritters and drinks. Also as a base for herbal tea. The leaf contains over 30% protein and is rich in Vitamin B12, potash and phosphorus. Valuable as a mulch, in compost and as a liquid fertiliser. Animal and poultry food. An exceptionally useful culinary and medicinal plant. Comfrey is native to Europe and Asia and is adaptable to most soils and positions, but prefers moist areas. Frost resistant but drought tender. A perennial plant, growing to 0.9m x 1m. Plants of Russian Comfrey are also available. Be the first to review “Comfrey, Russian root cutting” Click here to cancel reply.